See how to dress for a night out 100 years ago. Explore an exhibition of fashions from the 20th century. Discover fantastic outfits worn by women in New York in the mid-20th century. Compare dresses from the 1920s and the 1960s. Examine vintage fashions by famous designers from the 20th century. Watch a short video from the 1940s showing different evening dresses. See a beautiful 1950s evening dress decorated with large poppy patterns. Watch a short video about fashionable fabrics created by famous artists. Explore geometric Art Deco designs of the 1920s and 1930s. Find out about tie dyeing - which was used to make psychedelic clothing in the 1960s and 1970s. Discover more Art Deco fashions. Find out about party shoes from the mid-20th century in a short video. Explore an exhibition of accessories from the 20th and 21st centuries. 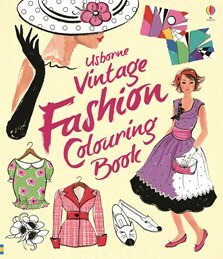 A delightful colouring book filled with gorgeous gowns, fabulous frocks and stylish accessories to colour. Each decade is represented with a range of colourful costumes to colour, from 1960s mod coats to the flares of the ‘70s. A concise introduction to the history of vintage fashion, this is the perfect book for any fashionista.